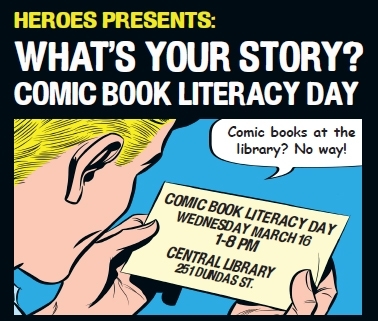 Comic Book Literacy Day is a really neat event coming up at the London Public Library that will feature talented cartoonists: Scott Chantler, J.Bone, Kathryn and Stuart Immonen, Diana Tamblyn and the Kill Shakespeare crew. Join us at the London Public Central Library from 1 8 pm for a day-long celebration of comic books and graphic novels. There will be something for comic-lovers of every age. • J. Bone is a Canadian comic book artist and writer who has worked on such titles as DC Comics’ Batman: The Brave and the Bold and Super Friends – Ask him to draw your favourite comic book character! • It’s a comic jam! Draw a panel and pass it on. Join in and create a comic together with artists of all levels. Let’s try and create as many collaborative comics as possible and put them on display! • Jeffrey Preston, creator of Cripz: A Webcomic. An introduction to web comics and creating your own wecomic. This entry was posted in Happenings, Press Releases, Retailers by Kevin A. Boyd. Bookmark the permalink.